The Dominican Republic has a great version of pumpkin to make deserts from, here it is called Auyama. However finding pumpkin pie spice can be a little tougher. Usually you can find it in the spice section of the larger stores like La Sirena, Jumbo and Nacional, but not all of us live near one of the larger towns that have those supermarkets. That shouldn’t stop you from making your favorite pumpkin desert. There are 4 ingredients to pumpkin pie spice and all of them are usually available in the “super mercados” found in most of the smaller towns. You can usually find a metal display rack with small 2-5 oz packets of different spices in most of the local supermarkets. Often they have the spices in powdered form but quite frequently you only find the “unpowdered” full cloves, stick cinnamon, nutmeg balls, etc. That means you pull out the old grater and pestle and mortar (Pilon in the Dominican Republic) to grind up your spices. Also, you may have to crush up a little fresh ginger to use as you need it. Normally you can find condensed milk at almost any colmado in the Dominican Republic. Evaporated milk though usually requires you hunt down a “super marcado” or super market. But unlike the non-fat powdered milk you find in the United States, the full cream powdered milk that you usually find in the Dominican Republic can make a pretty good evaporated milk. Evaporated milk is essentially milk with about half the water (50 – 60% or the water removed). You can make your own evaporated milk with Dry powdered milk. While in the U.S dry milk is usually non-fat, that is not the case in the Dominican Republic. The whole powdered milk(Leche Entera en Polvo) you find here makes a very good evaporated milk. 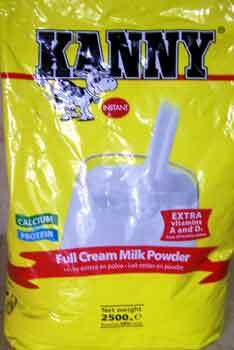 If you are in the Dominican Republic using the full cream milk powder you usually find here check the directions on the package first, but usually a three parts water to 2 parts milk powder works well to produce a good evaporated milk substitute, For instance Kanny says to mix 3 parts water to 1 part milk powder for normal milk so 2/3 cup Kanny full cream milk powder to about 1 cup water will yield good results (Normal milk is 1/3 cup powdered milk to 1 cup water. Like the milk you get in the States each brand of powdered milk has its own taste. We have tried several with good results. Some of the most popular brands in the Dominican Republic are Milex, Dano, Nido and .Kanny. For best results use cool water start with half as much water as you plan on using. Dissolve the milk powder into the water and then add the rest of the water. This method seems to work the best in keeping the milk from clumping. The milk can be used right away but it actually tastes a bit better if you let it stand a little while before using.